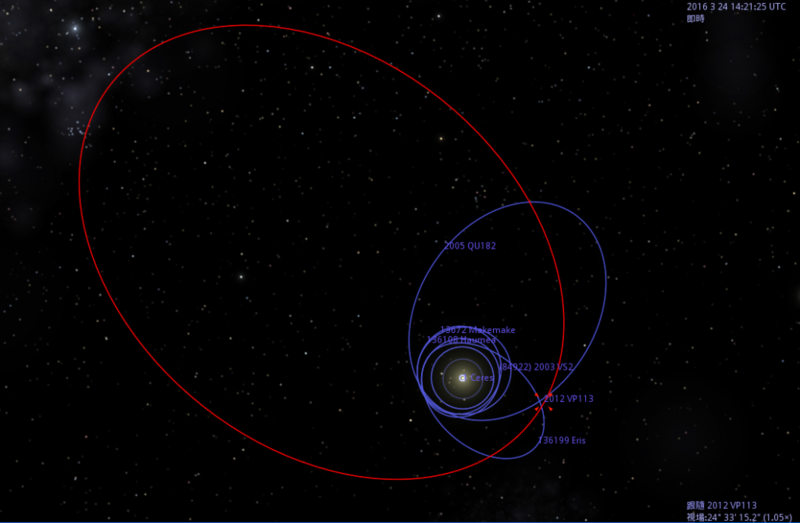 2012 VP113 is a planetoid in the outer reaches of the Solar System. It is the object with the farthest known perihelion (closest approach to the Sun) in the Solar System, farther than Sedna’s. Its discovery was announced on 26 March 2014. It has an absolute magnitude (H) of 4.0,which makes it likely to be a dwarf planet, and it is accepted as a dwarf planet by some. It is expected to be about half the size of Sedna and similar in size to Huya. The similarity of 2012 VP113’s orbit to the orbits of other known extreme trans-Neptunian objects led Scott Sheppard and Chad Trujillo to suggest that an undiscovered super-Earth in the outer Solar System is shepherding these distant objects into similar type orbits. Its surface is thought to have a pink tinge, resulting from chemical changes produced by the effect of radiation on frozen water, methane, and carbon dioxide. This optical color is consistent with formation in the gas-giant region and not the classical Kuiper belt, which is dominated by ultra-red colored objects.